ALL Ticket prices and VIP Package costs have been announced. The American Express pre-sale begins 12pm (local time) Tuesday 4 June 2013 and the Pre-sale ends: 6am (local time) Friday 7 June 2013. VIP Packages are available for all capital city shows. Packages are not available for the two winery shows. These do not include Mick Fleetwood Meet and Greets. These VIP Packages have a few extras that the Mick Fleetwood VIP Package didn't include - see below. With these VIP Packages and the prices they are charging without a Meet and Greet, it begs the question: Is Mick not offering his Meet and Greet packages in Austraila/New Zealand? At the moment, it appears he isn't. There are ticket links posted at mickfleetwoodofficial but no links to VIP Packages are available. This may change in the coming days. If they do become available, and they are sold at the rates charged on the rest of the tour it would be far less than the VIP Packages offered below - and they include meeting Mick! Both winery shows (Hope Estate and Geelong) have announced packages that are available through the venue directly. Tickets can be purchased either through Live Nation, Ticketmaster.com.au or Ticketmaster.co.nz. Ticketek is selling for the below venues only. There will likely be more dates announced possibly for both Australia and New Zealand, there are just too many large gaps between shows. According to their website, Tickets are selling now on the Hope Estate ticketline, call 1800 777 444. 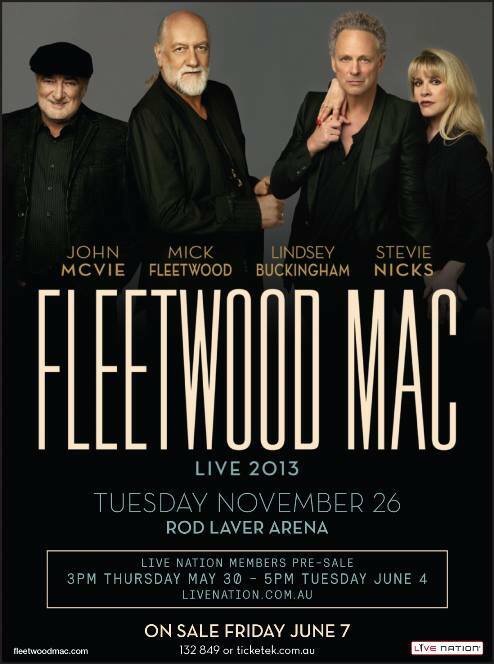 For Concert and Dining Packages call Ticketmaster on 1300 889 278.